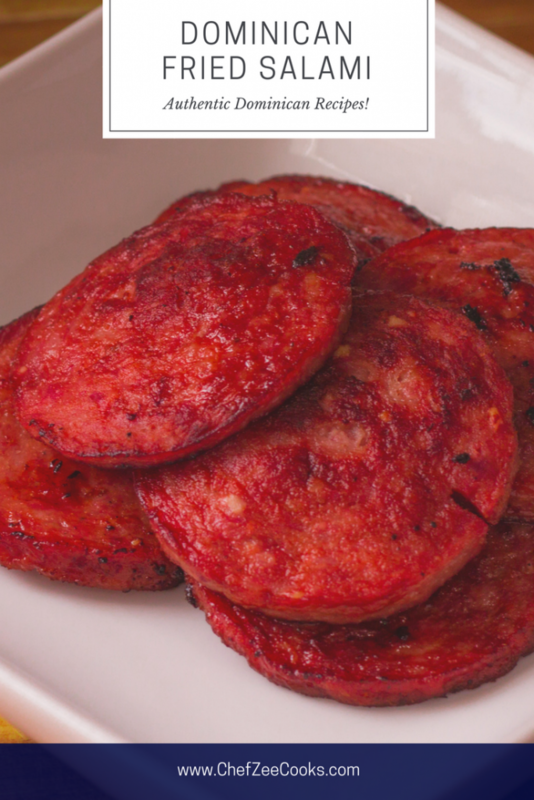 Fried Salami is one of the trifecta that completes the Tres Golpes- Three Hitters whenever you have Mangu. And if you’ve read my blog post on that amazing traditional Dominican dish then you know– believe the hype! Mangu is velvety smooth, buttery, and the definition of Dominican comfort food. You can pair it with practically anything and one of the most popular pairings is Dominican Fried Salami! Keep in mind, that Dominican Salami is very different than anything you’ve ever had before. It’s nothing like Italian Genoa Salami. In fact, Dominican Salami is in a class of its own. Dominican Salami is slightly smoky in flavor and salted to perfection. It’s a cured meat that comes already pre-cooked but we fry it to give it a nice crispiness. Just how crispy you like it varies person-to-person. Salami, just like Green Plantains, are extremely important to Dominicans. It holds a special place in our hearts. We eat it as a snack, with Tostones, or in rice like in my Locrio de Salami. In fact, Locrio de Salami is one of my all time favorite dishes! It’s considered a “poor man’s dish,” but I personally feel like a Queen every time I eat it. Cooking Dominican Salami is pretty straight forward. All you do is warm up some oil and drop in the salami slices. You then flip them after a few minutes until they reach your desired crispiness. Dominican Salami is similar to bacon in that it releases its own oil so you don’t have to actually add a ton of oil to fry it. If anything, I like to think of Dominican Salami and Dominicans version of bacon. I actually prefer Dominican Salami over bacon. Fun fact, I’m actually not a fan of bacon. **gasp** I know. Another neat trick to frying Dominican Salami is to cut a small slit into it. It’s totally optional but this helps the Salami remain flat while you fry it. This trick is totally optional and I do it from time to time. Now in the world of Dominican Salami, there are few brands that reign supreme. The one that you prefer will actually give you away and let people know which region of The Dominican Republic you’re from. My family is from Santiago, which is in the Cibao. Therefore, it’s no surprise that my favorite Salami is Induveca. Campesino is another wildly popular brand that’s just as good. The debate between Induveca vs. Campesino will usually result in a 50/50 split. I love Induveca and my boyfriend is a die hard Campesino fan. The third brands comes from the capital and is called Higueral. It’s red wrapper will always give it away. What’s your favorite Dominican Salami? 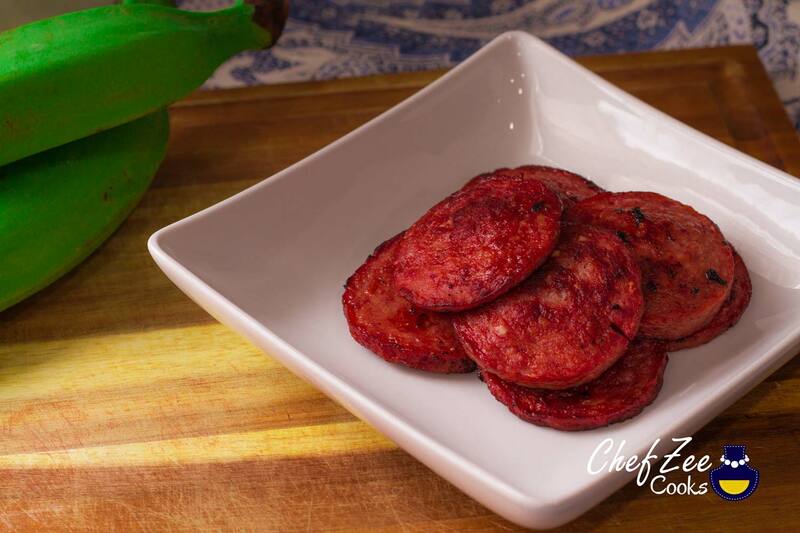 If you want to know how to fry up the perfect Dominican Salami be sure to check out my YouTube Channel: Chef Zee Cooks and watch the video: How to Fry Dominican Salami! Don’t forget to pin this to your board and share with your friends!